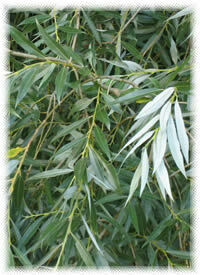 White willow has been used to combat fevers and pain for thousands of years. Willow bark may be the oldest herb known to treat pain and inflammation, the oldest recorded use is by Chinese physicians in 500 B.C. White willow was also used in ancient Assyrian, Egyptian, and Greek medicine as well as by Native American healers in North America. The inner bark of the white willow tree contains salicin, which is changed to salicylic acid in the body. The compound in aspirin, acetylsalicylic acid, is derived from salicylic acid. (Duke,James, Ph.D.) Herbalists use white willow much the same as aspirin, ie; to reduce fevers, pain, and inflammation in conditions such as painful menstruation, arthritis, and neuralgia. White willow works slower but lasts longer than aspirin and has less side gastronomic side effects due to the large amounts of tannins that protect the stomach. Newmark, Thomas M. Willow is used mainly in weight loss formulations to enhance the actions of other herbs. This is sometimes referred to as "stacking" in body building. 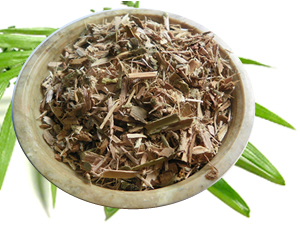 White willow can be used in skin and beauty treatments. Make a strong tea of the bark (decoction) and apply the cooled liquid to aid healing of sores, burns, or cuts. Decoctions of willow bark tea can be used as a gargle to treat inflamed gums. 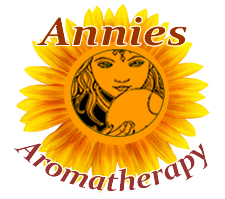 Preparation Methods & Dosage :Often taken in capsules, a suggested dosage is 225 mg of white willow bark four times daily, but follow package directions on capsules and tinctures. It is hard to judge the amount of salicin in the bark, a bark tea can normally be taken 3 to 4 times daily, a daily cup or two of willow bark tea would probably provide the equivalent of the low aspirin dose recommended for heart attack prevention. Use the chopped bark, not the powdered bark to make your tea. Add ginger, anise, or cinnamon to enhance the flavor. Tinctures of willow bark (1-2 dropperfuls/1-2 ml) are highly effective way to take the herb. White willow is best when used over long periods of time. White Willow Side Effects: Do not take willow bark if you are allergic to aspirin, are currently taking anti-platelet or anticoagulant drugs as this may increase the chance of stomach bleeding. The white willow tree grows north to Nova Scotia and south to Georgia over the eastern portion of North America. A large tree with rough gray bark and slender, graceful branches that produce tiny, yellow flowers in April and May followed by thin, green leaves. The bark is easily separable through the summer, and is the part that is used medicinally. Newmark, Thomas M. . "Beyond Aspirin" SCB, (2000) Willow bark is the original source of aspirin and many other medications for arthritis and rheumatism.Unlike aspirin, the salicylates in willow bark do not increase the risk of bleeding making willow bark useful for people who have chronic joint pain but cannot take NSAIDs or COX-2 inhibitors.